Rui Alves is a Portuguese furniture and product designer whose work is firmly grounded in traditional crafts. Hailing from a long line of skilled carpenters and craftsmen, it’s no surprise that traditional woodworking skills play a key role in the elegant, colourful and playful design solutions emanating from Rui’s My Own Super Studio design practice. Combining a love of traditional woodwork, many of the pieces still retain a simple and practical sense of traditional southern European furniture traditions about them without ever really seeming rustic or overly folksy. This is probably because Rui Alves’ approach is one in which the traditions of European modernism and is various modular vernaculars are deployed as much as his love of traditional craft. Similarly, rather than restricting himself to the traditional use of wood, he utilises the visibility of more traditional grain in interesting and unusual combinations with bright surface finishes. 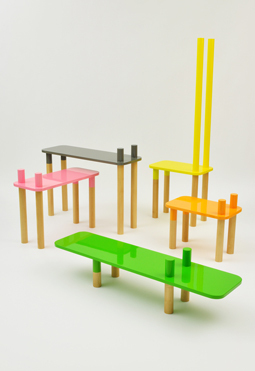 For example in his ‘welcome to the jungle’ set of modular storage and basics, the simple round wooden legs of the animal-like forms that comprise the design set are set off by bright surface colours that both act as decoration and an indicator of the particular animals to which each piece refer. The pieces can be used individually for everything from occasional tables to hallway furniture useful for hanging jackets and playing home to a telephone. Stacked on top of each other in varying combinations, they form a bright and practical storage unit. 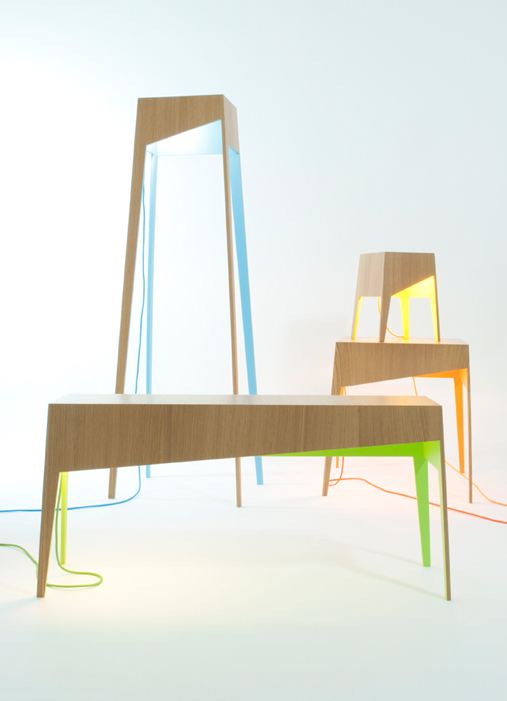 The same play with colour and modular design is also used in his ‘fiss family’ series. Consisting of a standing lamp, a table lamp and two sizes of table, here the trick has been to place the colour on the interior of the pieces with the wood grain forming the skin. Whilst all perform different functions, they are effectively a cleverly thought out reworking of the same four-legged, flat-topped form containing a light source. In a modular way, one is perfectly capable of using one of the tables – with its own attractive contained light source beneath- to house the table lamp to provide light on its horizontal surface.